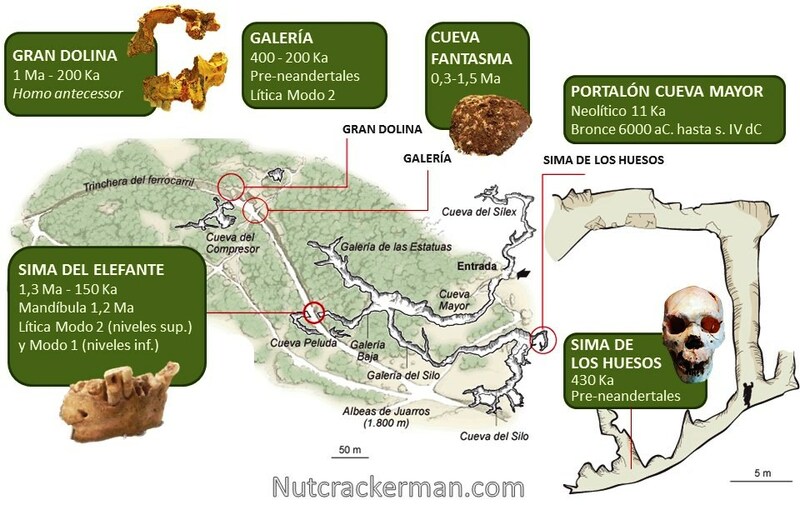 The Atapuerca complex is composed of several paleontological sites located along the southwest side of the old mountains called Sierra de Atapuerca, in northern Spain. In the surroundings there is a number of other smaller sites with evidences of neandertal and other ancient human presence, including open air places. In 2016, more than 300 people have worked on this vast paleontological complex. Sima del Elefante (‘Pit of the Elephant’): a site with 10 meters of sediments. The upper levels are dated to 200-230 Ka. and contain faunal remains associated to Acheleuan lithic. The lower levels are the oldest known locality in Atapuerca. In 2007 a fragmentary mandible with some teeth was recovered, dated to c. 1.2-1.3 Ma. which is the second oldest evidence of human presence in Western Europe up to date, only after a 1.3-1.4 Ma. child tooth from Orce, Spain published in 2013. 2016! The excavation of levels TE9c and TE9d has ended. TE9d has yielded several remains of birds, bears as well as herbivores (bovid and cervid) with clear evidences of human activity 1.3 Ma, including a flint flake. Gran Dolina (‘Great Sinkhole’), a huge trap that contains a comprehensive faunal assemblage representative of the Lower Pleistocene. In 1994 several stone tools and human fragments from at least 6 individuals were found, with tool marks suggesting cannibalism. They were dated to 780-800 Ka. and belonged to a new species, Homo antecessor. 2016! The focus was levels TD10 and TD4. TD10.3 level dated to 450 Ka, which has yielded many rests of great herbivores (equine, cervid, bison, rhino) as well as carnivores (lion, wolf). The hominin activity is not big at this level and is represented by several Acheulean tools. In total more than 118 K fauna remains and 35 K tools have been found at TD10. 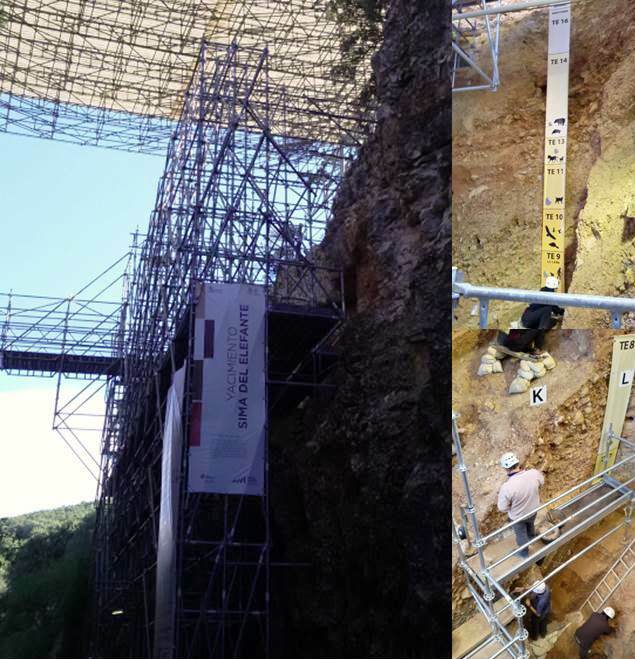 TD4 covers the 0.4 Ma gap between Homo antecessor found at Gran Dolina (0.8 Ma) and the 1.2 Ma mandible found at Sima del Elefante. The site has produced several tools of c. 1 Ma, deer antlers and two complete mandibles of jaguar. Galería (‘Gallery’): it was a natural trap where many animals fell down between 200-300 KYA and their bones were defleshed by humans, who used the site not permanently but rather from time to time to enter and scavenge. 2016! Abundant Acheulean tools and many horse bones have appeared, including skulls, vertebrae and ribs. The hominins accessed this cave to get the legs of the animals with the richest meat assemblages. This is a karstic complex known since the 1860s where some ancient human remains started to arise in the 1960s. Sima de los Huesos (‘Pit of the bones’): is the place with the largest number of hominin fossils found. More than 80% of the total fossil record of the Middle Pleistocene were extracted from Sima de los Huesos! In total 29 individuals have been recovered so far, with several almost complete skeletons. They are dated to 430 Ka. Initially classified as Homo heidelbergensis, but now they are considered as incipient Neandertals, as their nuclear DNA demonstrated in March 2016. 2016! New hominin fossils: 3 phalanges and several fragments of tibia, fibula, humerus, clavicle, ribs and cranium. These are the only hominin fossils from the Middle Pleistocene found in Europe in 2016. Galería de las estatuas (‘Gallery of the statues’): is the only site in Atapuerca with remains from the Mousterian period. 2016! New finds of fauna remains (equines) and Mousterian tools. The pollen found on the uppers levels show a climate change c.48-52 Ka transforming the type of landscape from steppe to open forest. Portalón (‘big gateway’): is the main entrance to Cueva Mayor. It shows a complete record of human presence between the Neolithic (7 KYA), Chalcolithic, and Bronze Age until the 13th century. 2016! New remains of megafauna (equine, bovid) that were carried to this site and processed here. The most exciting news in 2016 came from a new site, Cueva Fantasma (‘Ghost Cave’), studied from 2015, and located by the Trinchera area. Cueva Fantasma is a huge site of 30 meters wide with an amazing potential of 20 meters of sediments, covering ages from 0.4 Ma up to maybe 1.5 Ma. Although this year’s work was only focusing on doing geophysical surveys to this site, in the last days of the campaign a fantastic fragment of human parietal bone appeared. This specimen from the Middle Pleistocene is the first hominin found here, a site that will surely become very famous in the next years. Esta entrada fue publicada en Actualidad y etiquetada Atapuerca. Guarda el enlace permanente. ← ¿Qué es la mandíbula de Bañolas? Hola Roberto, son muy interesantes las noticias sobre los nuevos hallazgos de la campaña 2016 en Atapuerca. Esperemos más noticias de la cueva Fantasma en próximas campañas pues parece muy prometedora. Saludos. Eduardo. Hola Eduardo. Así es, parece que Cueva Fantasma podría dar trabajo a un par de generaciones de investigadores, al menos. Un saludo. Muy buenas Roberto. Me llamo Mario Modesto y soy el autor de la fotografía del parietal de Cueva Fantasma. El crédito de la imagen es Mario Modesto Mata / EIA. Así aparece,entre otros en el Correo de Burgos (http://www.elcorreodeburgos.com/noticias/burgos/cueva-fantasma-da-primer-fosil-humano-pleistoceno-medio_130858.html). Agradecería que cambiaras el crédito de la misma. Gracias.